A stupid mod about making sheep more aesthetically pleasing. You NEED chisel 0.0.7.7 or higher to use this mod. Make a iron or diamond chisel and right click to open the chisel preview. Left-Click on the Sheep you wish to chisel. Sheep should now be very confused, and a block will be removed from the chisel. 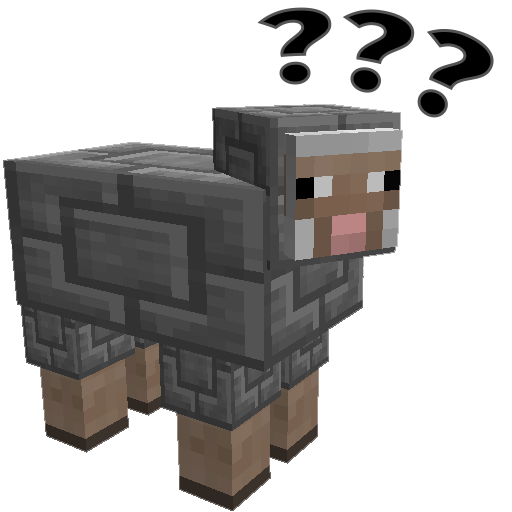 Left-Click on a sheep when no item is in the preview slot, the block will be returned to you. This is disabled by default because of the stuttering of it recalculating chunk lighting. Magma sheep deal "walking on fire" damage. Crafting Table Sheep will auto-craft according to the recipe. Leave your items in the sheep and it will eat any items it sees to produce the result. Opts in or out for Chance Cube sheep. Shear Madness supports changing the behaviour of what happens when you attempt to shear a sheep, this option can be modified in shearmadness.cfg in the /config/ directory. S:behaviour controls the shearing behaviour. ChiselFarm - You can farm blocks by allowing the sheep to regrow. Not recommended for server owners as it currently allows users to grow diamond, iron and redstone blocks from sheep. CannotShear - Shearing is completely disabled for these sheep. They will need to be reverted to normal before they can be sheared again. S:breedingBehaviour will determine what happens when two sheep mate with each other. You can change whether specialized sheep function or not using their configuration sections. Check the shearmadness.cfg file for details. I have lots of ideas for other shearing behaviours and other features. Feel free to drop ideas or bugs to my GitHub tracker, other feedback is welcome here and on Twitter. Will I be able to chisel pigs and other mobs in the future? I'm not really planning on it, sheep have a nice layering system that separates the body from it's wool. Your mod is one big dupe glitch! I know, that's why I released 1.0 with shearing behaviours. Set it appropriately. This should already have been fixed in a more recent version? Have you tried updating the mod yet? Does this work with Chisel and bits? Totally does. Was pretty surprised when I was told. Not sure if this is Working As Intended, but I thought I'd mention it here. I'm using version 1.5.1 for MC1.10.2. I have the cheaty dupe setting turned on. I had shears in my offhand for no particular reason and my clay sheep sheared plain wool blocks. They then regrew the clay coats and I was able to shear them normally, but only from the main hand. I'm going to go with bug. Admittedly, it's been a while since I exercised cheaty-mode. No, you've read it right. I was under the impression I'd already fixed that bug with the latest release, but apparently I didn't. I'll have a new version for you within the next 5 hours. Try the new version, It should fix your issues. Is this only for 1.10? Can u make it 1.7.10 compatible? I have a 1.11 port ready to be released once the chisel folk fix some bugs for me. I'm sorry to say, but I don't intend to support 1.7, each version of Minecraft I support slows down my development pace, as every change needs to be ported to each version and then tested individually. Because of this, even the 1.10 branch is likely to become bug fixes only once the 1.11 version is released. bummer, I was just evaluating using this for 1.7.10, and would have loved to use this in my ModPack, but unfortunately, as you pointed out, You have no intention of backporting to 1.7.10. This does raise an interesting question though; Does this mean that you are willing to allow someone else to backport this to 1.7.10 for you (handling the bugfixes for their version themselves obviously)? This could be an interesting mod to combine with botania, have mana producing sheep. Oh nuts. I'll work on it tonight.